and what did I love? I think style is just the end result of personal experience. It would be problematic for me to photograph in another style. I’m drawn to places and subject matter that have personal connections for me and I photograph in a way that seems right. Where does it all come from, who knows? On a fabulous fall day with near perfect temperatures it seemed like the ideal time to criss-cross the county and photograph some beautiful fall color. The aspens glowed a brilliant yellow against the evergreens and wild turkey and deer added that pastoral feeling to the landscape. I’ve been doing a lot of night photography of late and more often than not for me, those final images remain in color. Deep blues, purples, and pops of color from a handheld torch that I like to call my paintbrush. I suppose it would only be natural that I would slip back into my comfort zone of monochromatic landscapes. Today we found vibrant yellows, deep oranges, and glowing pinks but what did I like the best at the end of the day? 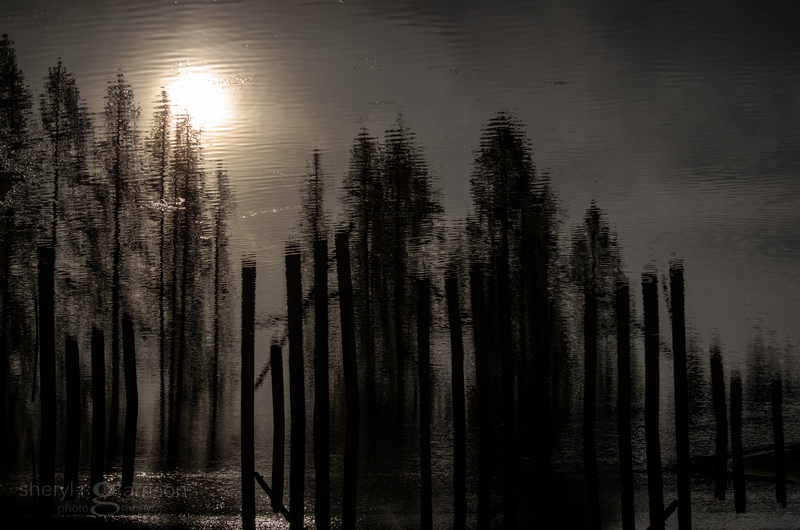 A backlit water scene that with its trees and stark remains of a bridge were reminiscent of our lengthy and punishing fire season. Without the distraction of color I find these scenes to be so much more tranquil and meditative. My eyes are drawn to the patterns and nuances of the shading. Michael Kenna’s work is simply brilliant and his observation of photographing in a way that seems right is exactly what I strive to do. Developing personal style in photography or other mediums I think just comes with time. I can remember early on sitting on the floor and with my eyes closed trying to change lenses and dial in particular settings. This learning to do things by feel and knowing which way the dials worked to make changes in my settings has held me in good stead for night photography. Once the tools were learned it seemed easier to play with the camera and capture the images that seemed right to me. How well do you know your camera? Turn the lights out and see! I’m just a point and click photographer but I do appreciate the expertise you have attained with your cameras. Your pictures are wonderful and keep getting better. …and partly because your image is mesmerising, S.